INCREDIBLE BENEFITS OF PINE NUT OIL PLUS THE EFFECT OF ROSE HIP OIL! INGREDIENTS: 100% natural Cold-pressed Extra Virgin Siberian Pine Nut Oil, 100% natural Rose Hip Oil. One of the most wonderful and beneficial gifts of Siberian Taiga is Rose Hip Oil. Wildly harvested, 100% natural Rose Hip berry is gathered carefully, by people lovingly devoted to this task. Using multistage cold extraction method originally developed in Russia, we preserve all nutritional value and bring you free of artificial ingredients, unique, 100% natural Siberian Rose Hip Oil extract under Siberian Pine Nut Oil brand name. 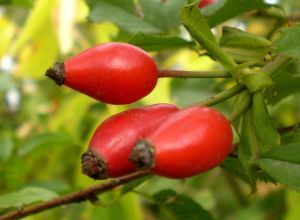 Rose hips of some species, especially Rosa canina (Dog Rose) and R. majalis, have been used as a source of Vitamin C. Rose hips are commonly used as an herbal tea, often blended with hibiscus and as rose hip oil. They can also be used to make jam, jelly, marmalade and wine. Rose hip soup, "nyponsoppa," is especially popular in Sweden. Rhodomel, a type of mead, is made with rose hips. Some species of rose are sometimes referred to as rose hip, including Rosa canina (dog rose), R. rubiginosa, and R. moschata (Musk-rose). - Particularly high in Vitamin C, with about 1700–2000 mg per 100 g in the dried product, one of the richest plant sources. - RP-HPLC assays of fresh rose hips and several commercially available products revealed a wide range of L-ascorbic acid content, ranging from 0.03 to 1.3%. - Rose hips contain vitamins C, D and E, essential fatty acids and antioxidant flavonoids. - Rose hip powder is a remedy for rheumatoid arthritis. - As an herbal remedy, rose hips are attributed with the ability to prevent urinary bladder infections, and assist in treating dizziness and headaches. Rose hips are also commonly used externally in oil form to restore firmness to skin by nourishing and astringing tissue. - Brewed into a decoction, can also be used to treat constipation. - Rose hip oil contains a lot of iron, so some women brew rose hip tea during menstruation to make up for the iron that they lose with menses. Rose hips are used for herbal tea, jam, jelly, syrup, beverages, pies, bread, marmalade, and rose hip oil. Rose hips have recently become popular as a healthy treat for pet chinchillas. Chinchillas are unable to manufacture their own Vitamin C, but lack the proper internal organs to process many vitamin-C rich foods. Rose Hip Oil provides a sugarless, safe way to increase the Vitamin C intake of chinchillas and guinea pigs. The fine hairs found inside rose hips are used as itching powder. In World War II, the people of England gathered wild-grown rose hips and made a Vitamin C syrup for children. This was because German submarines were sinking many commercial ships: citrus fruits from the tropics were very difficult to import. Rose hips are used for colds and influenza. The Latin binomial for this herb is Rosa laevigata.